From Minneapolis (273 miles): Get on I-35W N, Take I-35 to MN-33 N in Cloquet. Take exit from I-35 N. Get on US-35 N. in New Independence from MN-33 N, Merge onto US-53 N. Turn right onto Gamma Road/County Hwy-122. Turn right onto Gappa Road/County Hwy-123. Turn right onto Burma Road, keep right at the fork to continue on Burma Road. From Duluth (142 miles): Turn left onto E. Central Entrance/MN-194. Continue to follow MN-194. Stay straight to go onto Miller Trunk Hwy/US-53 N. Continue to follow US-53 N. Turn right onto Gamma Road/County Hwy-122. Turn right onto Gappa Road/County Hwy-123. 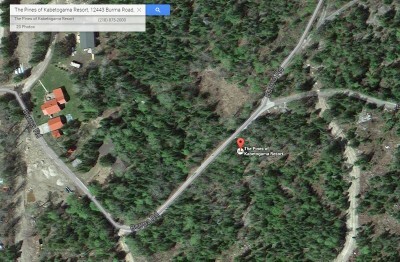 Turn right onto Burma Road, keep right at the fork to continue on Burma Road. 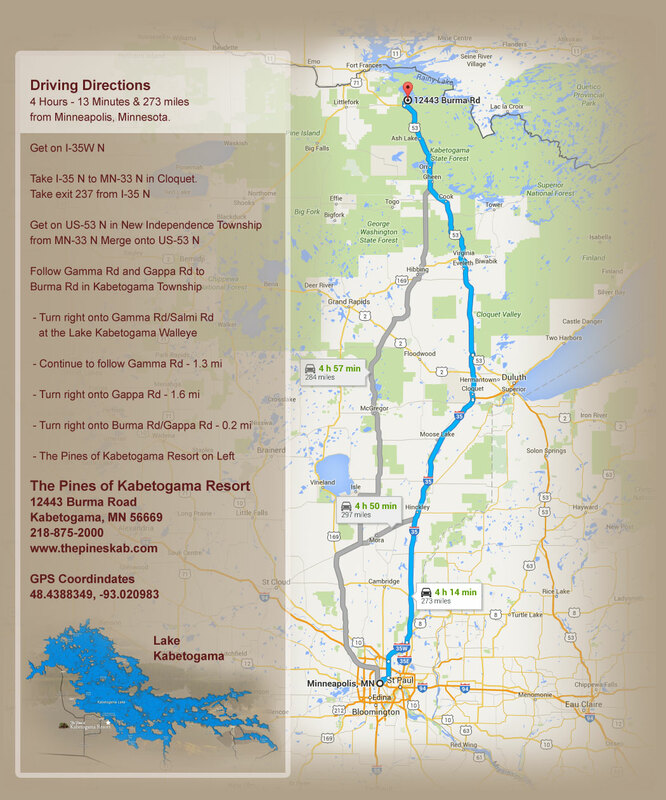 Driving directions to The Pines of Kabetogama Resort.